IT'S COMMONPLACE TODAY to decry the commercialization of Christmas, to yearn for the kind of holiday depicted in old engravings: a candle-laden tree, a hearty Yule log burning in the fireplace, some nuts to crack and - for those both lucky and good - an orange. But our idea of a "traditional Christmas" leaves out an important element: superstitions. The time between Christmas and the New Year was once thick with superstitions and folk beliefs. An old-fashioned Christmas would have included not only Christianized versions of pagan traditions (such as the tree and that Yule log), but many other rituals and auguries, some of which seem to us more like Halloween traditions than Christmas ones. At about the same time that modern Christmas traditions such as sending Christmas cards and eating turkey began, researchers and enthusiasts collected many waning folk beliefs and compiled them into exhaustive lists of superstitions, mainly from Great Britain. The results were impressive Victorian volumes with titles like "Traditions, Superstitions, and Folk-Lore" or "British Popular Customs, Present and Past," which - thanks to Google Book Search or the Internet Archive - are now available for anyone looking to celebrate a truly old-fashioned Christmas. Some also believe that those who are born on Christmas Eve turn into ghosts on that day every year while they sleep. If you were born on Christmas Eve and don't want to have this happen to you, the remedy is to count the holes in a sieve from 11 o'clock on Christmas Eve until morning. Other Christmas superstitions revolve around the natural world. Some white-thorn trees are supposed to blossom only on Christmas Day; other plants, including myrrh, save their blossoming for Christmas Eve - often for only an hour. Hay carried around a church three times on Christmas Eve was said to ensure that cattle would fatten easier on less feed in the year to come. Christmas Eve is when animals behave oddly, too: cattle, donkeys, and oxen are said to fall on their knees and moan at midnight. If you can find a kneeling donkey on Christmas Eve, and make the sign of the cross on its back, you will get your heart's desire. Cattle, donkeys, and oxen, as well as the other animals, are also given the gift of speech on Christmas Eve. On the same night, you can also hear the bells of lost churches that have been flooded or buried by landslides and earthquakes. Christmas Day is a great day for increasing your luck for the year, truly important in the days when one unlucky turn - an injury, or a bad harvest - meant not just inconvenience, but possibly starvation and death. The first person to hear the rooster crow on Christmas Day is assured of good luck (and, in Ireland, is due a cup of whiskey or tea). Every mince pie you eat at Christmas means a happy month in the year to come - if each pie is made by a different person and eaten in a different house. If you carry in your pocket a scale from a fish eaten at Christmas, your purse will be full all year. Other things that bring good luck on Christmas Day include wishing someone a Merry Christmas before putting on your socks and shoes, sneezing, eating breakfast by candlelight, hearing a cricket chirp, kissing the oldest person in the house, giving coins to a beggar, and stirring the Christmas pudding. 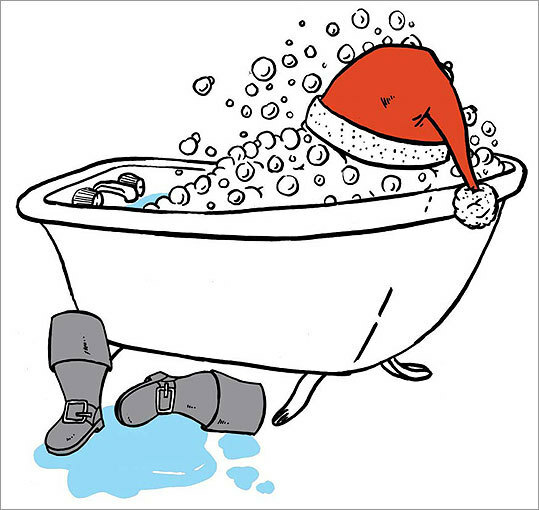 Bathing on Christmas Day will keep you safe from fevers and toothache in the year to come. Unlucky things on Christmas Day include picking up nuts or fruit from the ground, leaving the dinner table before everyone has finished, sending carolers away without giving them any money, being the first one home from church, carrying a spinning wheel from one side of the house to another, stepping on cotton thread, receiving a present of new shoes or tanned leather, and letting the candles or the fire go out. If you eat nuts without honey on Christmas Day, you will lose your teeth. On Christmas Eve it is unlucky to spin or sew, to grind grain, or to leave the dishes unwashed. Fittingly for a holiday in which souls gather against the dark and face the uncertain year to come, Christmas superstitions offer the hope of predicting the unpredictable and controlling the uncontrollable. Whatever you dream on any of the 12 nights between Christmas and Epiphany (Jan. 6) will come to pass within the next year. The weather for the whole year is also determined during this time: as the weather is on each of these days, so will it be on the corresponding month of the following year. If you really want to know the rainfall for the next year, you can hollow out 12 onions, putting salt into each. Each onion is named after a month of the year, and there will be rain in every month where the salt in that onion is wet. And if Christmas Day falls on a Thursday, the following year will be windy. To predict the next year's harvest, count the stars on Christmas Eve, and there will be as many sheaves as you have counted stars. If the sun shines through the limbs of the apple trees on Christmas Day, there will be a good crop of fruit next year. But if there's a full moon on Christmas, the following harvest will be scanty. At Christmas women can also predict the course of their love life (not many spouse-finding superstitions work for men). Young women who go out and hit pigs with a stick at Christmas can tell the age of their husbands-to-be: if the first pig that squeals is old, that means an old husband; a squealing young pig equals a young husband. If there's a henhouse handy, a woman can knock on its door between 11 and 12 on Christmas night. If a rooster answers her knock, she will be married, but if her knocking is followed by silence, she will never marry. Looking into a well on Christmas Eve will show the destined husband - the same can be determined by throwing a ball of yarn in the air at midnight on Christmas Eve; the arrangement of the yarn on the ground will look like the future husband's face. If you're unmarried and no one kisses you under the mistletoe at Christmas, you won't marry during the following year. The last day to indulge your Christmastime superstition is Candlemas (Feb. 2). To avoid bad luck, all of your Christmas decorations should be down by that day. But be careful what you burn: it's unlucky to burn Christmas greenery, except for mistletoe, which must be burnt or else those who kissed beneath it will become enemies. Every leaf left up after Candlemas will result in either a goblin seen or a death in the house during the year. These superstitions are all hundreds of years old, at least, but there's room for new ones to calm our new anxieties. For instance, if you give a friend an electric nose-hair trimmer at Christmas, you will quarrel in the year to come, and not tipping your newspaper delivery person will result in bad luck all year long. Erin McKean is a lexicographer (dictionaryevangelist.com) and blogger (dressaday.com).